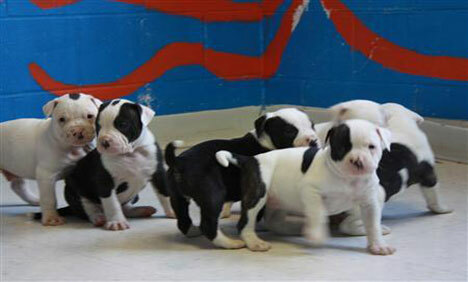 CLEVELAND: An Ohio man has been charged with animal abandonment after a litter of six English bulldog puppies was found in a suitcase with a tag bearing his name, according to Humane Society authorities. Cyndi Condit, spokeswoman for the Toledo Area Humane Society told Reuters Wednesday that the man, identified as Howard Davis of Toledo, lived only two blocks from where the suitcase was found. The mother of the puppies was found pacing around the suitcase, which attracted the attention of a passerby. "Howard's name was on the tag of the suitcase and the mother was licensed to him," Condit said. After the dogs were found April 4 in a Toledo alley, Davis was charged with a second degree misdemeanor, which carries with it a maximum $750 fine and 90 days in jail, according to John Dinon, the Toledo Area Humane Society's executive director. Davis told investigators that he had given the dogs to a friend in Michigan and that the suitcase had in fact been stolen earlier. There was no explanation as to how the adopted dogs got back from Michigan in the stolen suitcase. The puppies, three male and three female, are estimated to be four weeks old, too young to be separated from their mother, so they will spend at least another four weeks in foster care before they are eligible for adoption. Dinon said the shelter has received an overwhelming number of calls about adopting the puppies but that for now they are "evidence" in the case against Davis.